Hoover Dam’s flood protection allowed the creation of Lake Havasu further downstream. This reservoir supplies water to the cities of Southern California and Arizona. In 1931, while the United States was flat on its back in the Great Depression, the country rose from the mat, flexed its muscles and began building the mighty Hoover Dam, not only taming the angry, flood-prone, Colorado River but also demonstrating the distressed nation’s determination to survive economic fear. A curved solid concrete structure conveying simple strength as it blocks the cleft between the walls of Black Canyon, the dam extends 1,244 ft. (379.2 m) between the canyon walls and is 726.4 ft. (221.3 m) high, with a concrete base 660 ft. (201 m) thick and a two-lane highway on top. Hoover contains 3,250,000 cu. yds. (2.6 million cu m) of concrete, which has been compared to the amount of concrete in a 16-ft.-wide (4.9 m) highway between Pensacola, Fla., and Seattle, Wash. The awesome, graceful wall of concrete was built by men who swung over canyon walls, stacked large concrete forms atop each other hundreds of feet above the ground and slogged through wet concrete to maintain consistent quality. Hoover Dam entered the national psyche, such a symbol of hope in a time of national distress that it was featured on the cover of Life Magazine in the 1930s. The Federal Government and some of the early settlers were looking at potential dam sites on the Colorado to meet water needs as early as the 1880s The importance of stemming the Colorado’s fury became more obvious as the Imperial Valley of California and the nearby Yuma, Ariz., area developed into major agricultural centers in the first decades of the 20th Century. Another purpose, of course, was power. Generators in the dam’s powerplant could produce electricity for Los Angeles, Las Vegas and numerous other cities. Davis had been pushing the dam idea as early as 1902. His, and other, efforts gradually bore fruit in recommendations to Congress for a “high dam,” culminating in the Boulder Canyon Project Act being signed by President Calvin Coolidge in 1928. As workers from all over the country headed for the construction area, the Bureau of Reclamation awarded the dam contract to a joint corporation of western contractors called Six Companies Inc. The contractors were Bechtel & Kaiser, San Francisco; MacDonald & Kahn, San Francisco; Morrison-Knudson Co., Boise, Idaho; Utah Construction Co., Salt Lake City; J. F. Shea, Portland, Ore.; and Pacific Bridge Co., Portland. The winning bid was $48,890,995. It included salaries, dynamite, and equipment such as trucks, but not construction materials such as the 5.5 million barrels of cement, and 55,000 tons of steel plants and castings that were used. It would be the highest dam, the costliest water project and the largest power plant up until that time. Job-seekers began showing up near the Black Canyon site, which was approximately 30 mi. downstream from the original Boulder Canyon proposed location, even before the contract was awarded. The average age of a laborer was 35, meaning that the workforce included some veterans of World War I. “High-scalers” climbed down the canyon walls on ropes to remove loose rocks before work could begin. Including former sailors, circus acrobats, Native Americans and others, they drilled holes into the rock with 44-lb. (20 kg) jackhammer drills, loaded the holes with dynamite and were pulled out of the way. After the explosion, they crowbarred loose any broken rock that remained. The scalers were a daring lot. “When the foremen weren’t looking, they would swing out from the cliffs and perform stunts for the workers below,” the Web site states. “Puddlers” slogged around in large boots, working the heavy concrete into holes. “Muckers” removed debris from excavations after dynamite blasts. The work went ahead 24 hours a day — the day shift, swing swift, and graveyard shift. Arc lights, purchased from a bankrupt San Francisco ballpark, lit Black Canyon for the night work. The maximum number of men working at Hoover Dam at any one time was 5,200. The average number during the four years between 1931 and 1935, when the dam was completed, was 3,500. The Six Companies began construction of Boulder City, a company town to house its workers, in 1931. It was known as the best “construction camp” in the world. Approximately 7 mi. from the dam, the town accommodated about 5,000 men in 1,050 wooden structures set on the windswept desert. Married men lived in separate cabins, others in large “refrigerated” dormitories with individual 7 ft. by 10 ft. rooms. A caterer served food, including ice cream, in a mess hall. Beer was sold —but no hard liquor. Most workers traveled to the dam and back on the company’s large double-decker buses. “A portion of the salaries of single workers went to the company to pay for living expenses and transportation,” Walsh said. The laborers were noted for always wearing clean shirts while in the town. Only one major crime, a holdup, was recorded during the four-year construction project. The workers adopted a black dog, born under one of the barracks, as their mascot. For many months, the dog acted as a fellow laborer, riding a bus to and from the dam, racing happily back and forth across the swinging catwalks 700 ft. above the river, and barking when he wanted to get to a particular work site on the “skips,” a type of open-air elevator. (The operators always stopped for him.) Every morning, the commissary packed him a lunch, which he carried in his mouth. When the mascot was run over by a truck at the dam, “tough, hard-rock men wept openly … it was the quietest afternoon Boulder City ever experienced,” the Web site said. The men carved out their mascot’s grave in the canyon wall. Today, a plaque on the canyon wall next to Hoover Dam’s visitors center is dedicated to the dog that became part of the dam’s story. Preliminary designs for a giant dam on the Colorado were being prepared by the Bureau of Reclamation several years before it was authorized in 1928. “The big questions were where to locate it, and how large it would be,” Walsh said. The site selected was 35 mi. southeast of Las Vegas. The dam would be on the boundary of Arizona and Nevada, half in each state, with the river as the dividing line. It would be the highest dam in the world up until that time. Behind it, the blocked waters would form the Lake Mead reservoir, one of the largest man-made bodies of water in the world — 115 mi. long and 589 ft. deep. This would cause a maximum pressure of 45,000 lbs. per sq. ft. at the dam’s base. The dam itself was a gargantuan project, preceded by huge preliminary work to divert the river. One of the massive first steps was diverting the river’s water by drilling and blasting 4,000-ft.-long (1,219 m), 56-in.-diameter (142.2 cm) diversion tunnels, two on each side of the river, several hundred feet upstream from the dam site. These tunnels, lined with 3 ft. of concrete, went through the canyon walls around the site and emptied into the riverbed. To turn the river into the tunnels, workers built two temporary cofferdams below the tunnels. They first constructed temporary trestles above the water. Trucks then dumped rocks and/or earth into the river to slowly erect the dams and stop up the river. An upper cofferdam, 600 ft. downriver from the inlet portals of the tunnels, was 98 ft. (30 m) high, reaching approximately 30 ft. (9 m) above the top of the tunnels. It was 450 ft. (137.2 m) long, 750 ft. (229 m) thick at its base, and contained 516,000 cu. yds. (394,510 cu m) of earth and 157,000 cu. yds. (120,035 cu m) of rock. Six-inch-thick concrete over 3 ft. of rock protected the upstream side and thick rockfill protected the downstream side. Before they could build this first dam, workers had to remove 250,000 cu. yds. (191,139 cu m) of river silt to provide a firm foundation. A lower cofferdam, built of compressed earthfill, was 66 ft. (20 m) tall, 350 ft. (107 m) long, and 550 ft. (168 m) thick at its base. It contained approximately 230,000 cu. yds. (175,848 cu m) of earth and 63,000 cu. yds. (48,167 cu m) of rock. A thick rock fill covered the downstream side of this dam. To lessen the force of water hitting the lower dam during floods, a rock barrier was built 350 ft. downstream from it. This barrier was 54 ft. (16.4 m) high, 375 ft. (114 m) long, and 200 ft. (61 m) thick at the base. It contained approximately 98,000 cu. ft. (2,775 cu m) of rock. 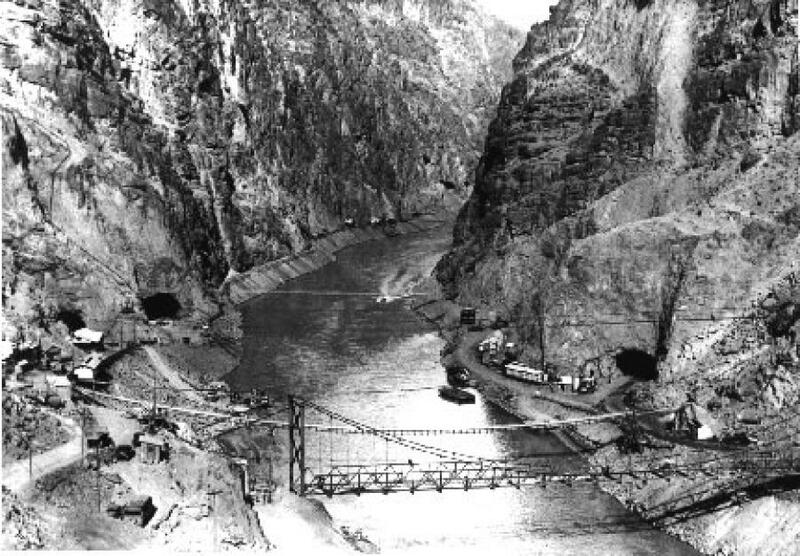 After the tunnels and dams were completed, the Colorado was diverted around the construction site on Nov. 14, 1932, well before the spring floods of 1933, which the tunnels handled without problems. The dam itself rose slowly, like a concrete giant, from the riverbed. The first concrete for the dam itself was placed on June 6, 1933, and the final concrete on May 29, 1935. Aggregate came from a 100-acre alluvial site 6 mi. upstream on the Arizona side of the Colorado, where floodwaters had deposited smooth rounded stones for millions of years. Excavated by dragline, the aggregate was loaded into rail cars and carried to a screening and washing plant on the Nevada side. Here, four screening towers separated it into fine, intermediate and course gravels, which then went by rail to a river-level mixing plant approximately 4,000 ft. above the dam site. At the plant, sand, water and Portland cement were mixed with the aggregate to make concrete for the dam or diversion tunnels. Loaded into buckets and transported to the job site by truck or electric train, the concrete was placed in the dam using 4 and 8-cu.-yd. (3 to 6.1 cu m) bottom-dump buckets, which were lifted from the cars and lowered into place by nine overhead cable ways. A very dry fix was used to produce the required high-strength concrete. Crane operators who moved the buckets into place had to work fast so that the concrete wouldn’t begin to set. As each bucket was dumped, seven puddlers used shovels and rubber-booted feet to distribute the concrete throughout the form, and pneumatic vibrators to ensure there were no voids. Rather than being a single block of concrete, Hoover Dam rose piece-by-piece as a series of individual trapezoidal columns, which were interlocking blocks, each five ft. high, built on top of each other. This approach allowed the tremendous heat produced by the curing concrete to dissipate. “It [the dam] was actually a jumble of concrete boxes rising upward in fits and starts, a horizontal five-foot-thick layer poured first on one column, then on another,” said author Joseph E. Stevens in his book Hoover Dam, An American Adventure (University of Oklahoma Press, 1988). 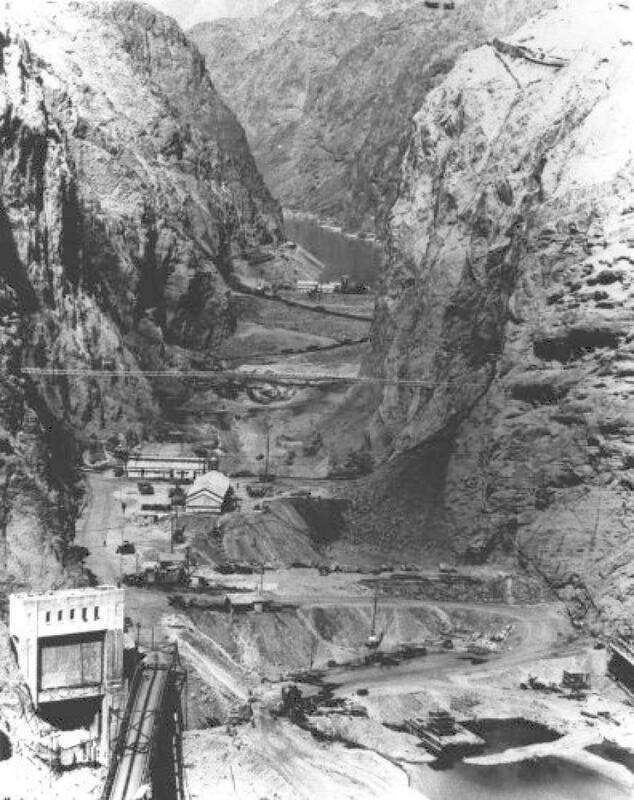 As the dam rose, a new completely automated concrete mixing plant was built on the rim of the canyon. It could produce 24 cu. yds. (18.3 cu m) of concrete every three and a half minutes. When completed in 1935, Hoover Dam had used more than 5 million barrels of Portland cement and 4.5 million cu. yds. (3.4 million cu m) of aggregate. The first man-made structure to exceed the masonry mass of the Great Pyramid of Giza, it became an American construction icon almost immediately. One can ride (or walk) over the dam on the two-lane U.S. Highway 93, which was built on top as part of the dam project. Arched spillways 27 ft. below the top, one on each side, would send any water getting that high into steep tunnels which connect to the diversion tunnels. They’ve only been used twice — in 1941, to test the system, and in 1983, to divert overflow from a flood. Each spillway has four, 5-million-lb. gates, which can be automatically raised or lowered according to the height of the water. President Franklin D. Roosevelt dedicated this massive structure as “Boulder Dam” on Sept. 30, 1935. That (or Boulder Canyon Dam) had been its original name in early plans for a site further upriver. In 1931, the new planned dam was unofficially called Hoover Dam to honor President Herbert Hoover, whose term was to end in 1933. Changed back to Boulder Dam under Roosevelt’s administration, it was officially named Hoover Dam once again by action of Congress in 1947. Total cost for the entire Hoover Dam project has been estimated at $385 million, with the dam itself costing $120 million. Hoover Dam now releases a normal stream of water for irrigation throughout the year, avoiding the devastating floods of the early 20th Century. The dam also allows mud and silt to be removed as precipitate, simplifying irrigation. Water from Lake Mead can irrigate more than 1 million acres of farmland in California, Arizona and Nevada, increasing crop production by 120 percent. Shortly after the dam was completed, the All American Canal also was completed as part of the project along the north side of the U.S.-Mexico border, from the Colorado River at Yuma, Ariz., to the Imperial Valley, assuring a constant source of water for irrigation. 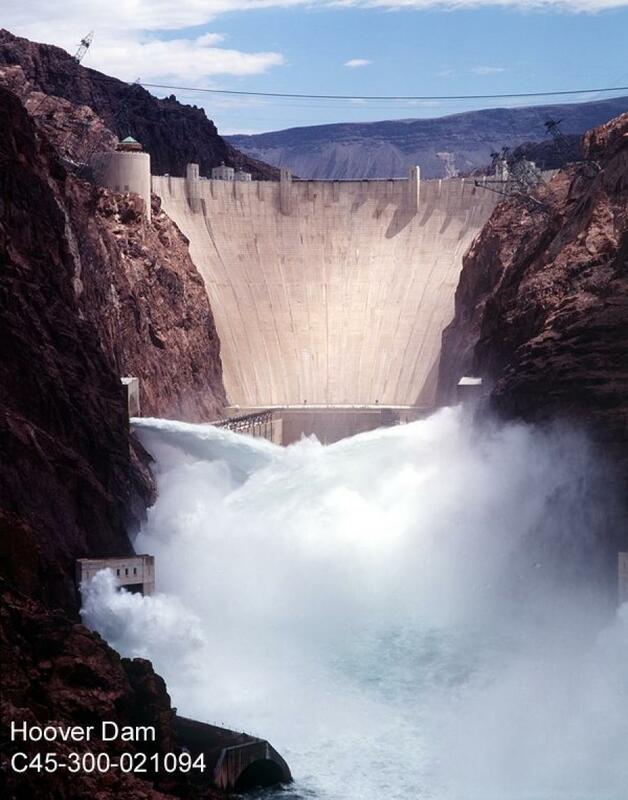 Hoover Dam’s flood protection allowed the creation of Lake Havasu further downstream. This reservoir supplies water to the cities of Southern California and Arizona. The Colorado River Aqueduct, stretching across 240 mi. of desert and mountain to the Pacific Coast, was built by the Los Angeles Metropolitan Water District with Hoover Dam power. It began delivering water to Los Angeles in 1941. 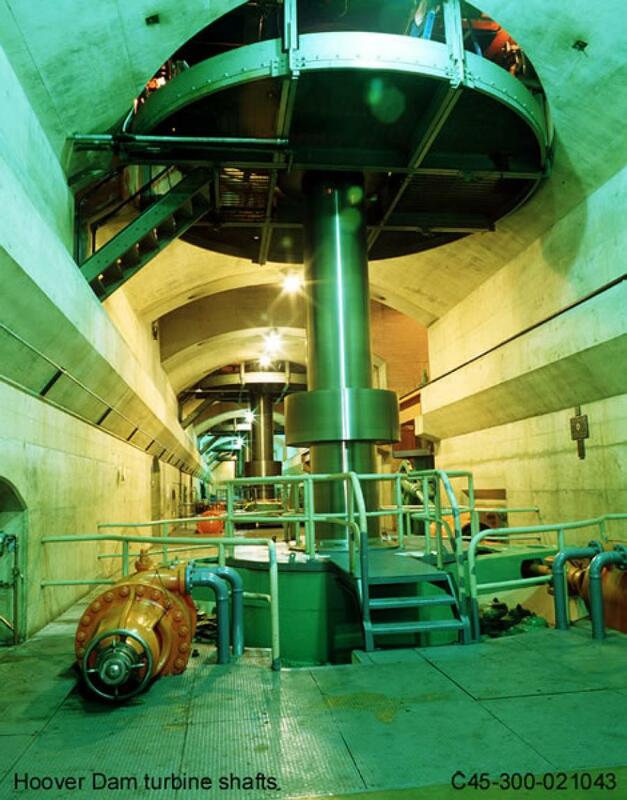 At the foot of the dam, a powerhouse contains 17 large generators, each producing enough electricity to service 100,000 people. The generating capacity of the Hoover Powerplant reached 1,334,800 kilowatts in 1961. 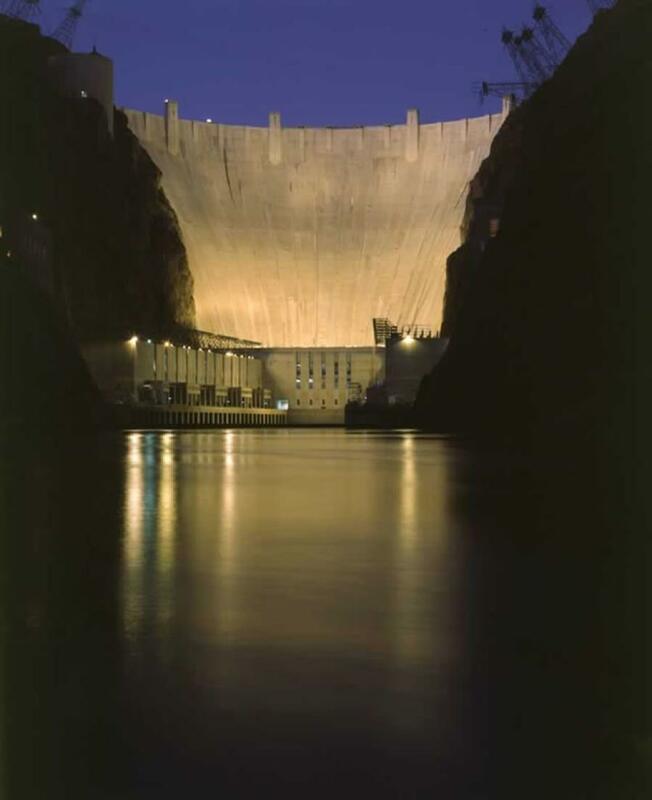 From 1938 until 1948, the Hoover Dam power plant was the largest hydroelectric producer in the world. Nine turbines were producing more than 700,000 kW by the end of 1939, producing electricity for Los Angeles; Pasadena, Calif.; Las Vegas and other cities, and supplying power to aircraft, steel and aluminum plants on the West Coast during World War II. Before 9/11, approximately 1.2-million visitors per year paid to tour the dam and its interior. Many visited the dam without paying (simply enjoying the view). The number of paid visitors is climbing back to an expected one million this year.